The Dark Angels were sold off a few months back as I'd finally reached my tipping point with them- whilst my love for the First Legion continues, I wasn't enjoying them as an army anymore. A young fellow here in Canberra bought them, so maybe I'll see them around some time. Here's some of the Kommandos I converted up- greenstuff, backpacks and stikkbombs for all! Yeah, so I finally got around to buying a Warhammer Fantasy army. Whilst they are still all sealed in boxes it's great to think I'll have a fantasy army up and running (hopefully) soon. 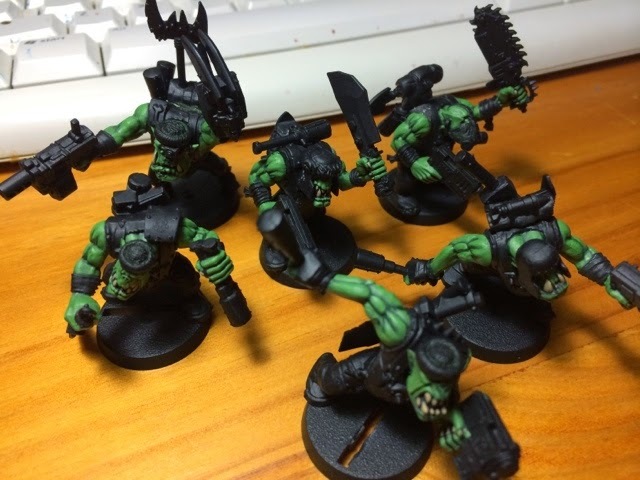 Like the Orks, a close combat oriented army, although I've recently bought a lot of old early 90s metal sorcerers so there'll be some serious casting going on. Hope to get some updates for them up soon. 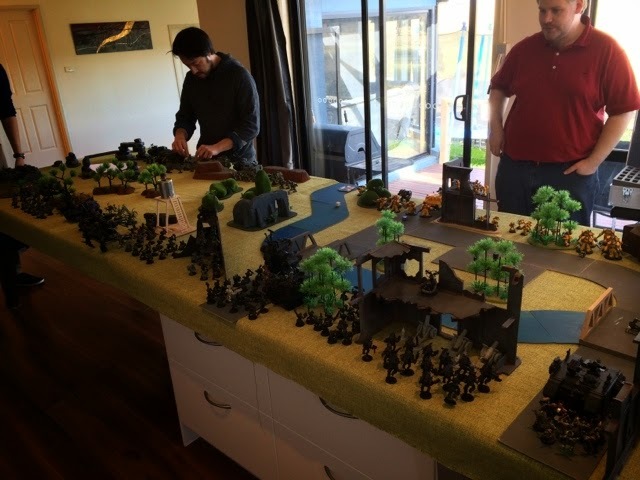 There's been a bit of sporadic battle recently- a large 40,000pt + Apocalypse game with the CNSG (Canberra Northern Suburbs Gaming) lads for the club's open day, and a smaller 12k team battle (pictured below). The Orks participated in both battles and acquitted themselves well- the new codex takes some getting used to but there's a lot to like! Here's some pics from the 12k battle. Oh and as a final note- got some colour put down on the Warlord Titan. He's looking pretty nifty in red. Wow, I’ve now registered over 10,000 page views!! How did that happen?? I think that’s pretty good for a small out-of-the-way blog that doesn’t get updated nearly enough. 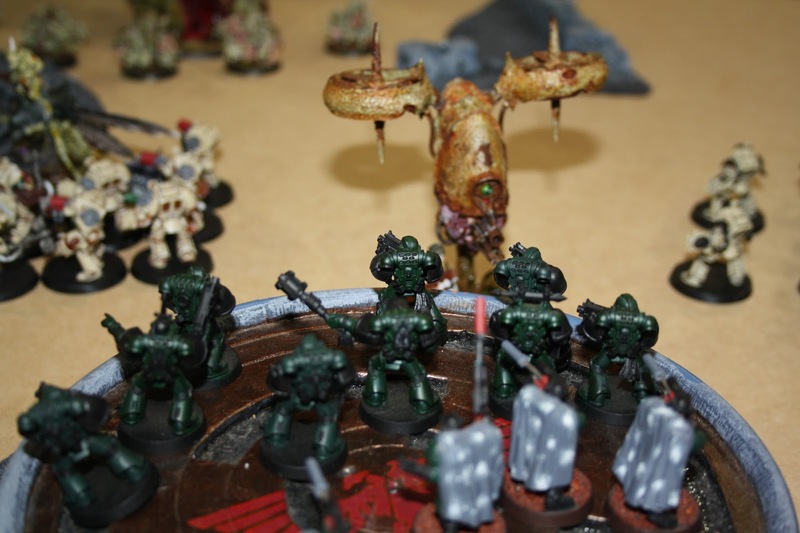 I started this blog in August 2011 as a way to re-focus myself in the hobby, and along the way I’ve bought, built and sold two large armies (Blood Angels and Orks), had a baby (best thing ever!) 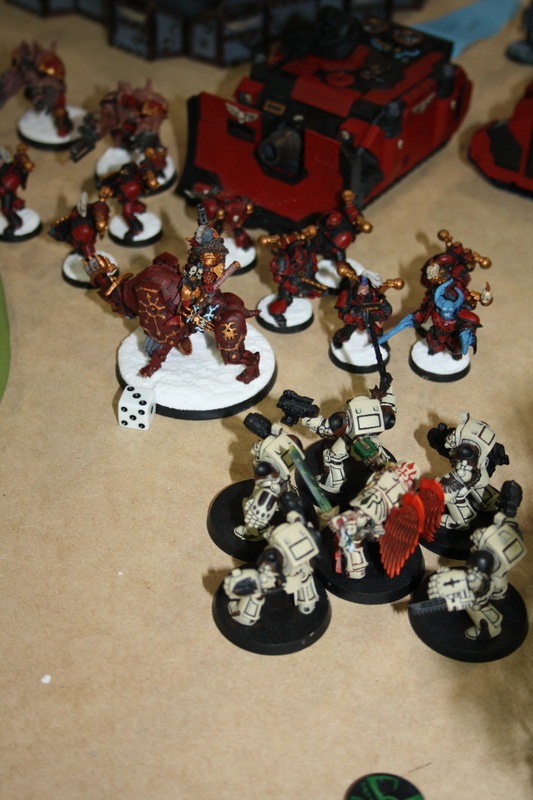 and had two ‘I’m selling it all, I hate you 40K!’ mega meltdowns/ fire-sales. My posting has gone from insane amounts per month, to 3-4 months without any updates. But in all that time I’ve watched the page-views slowly increasing as people came along for a look. Now before I go any further, please understand that I’m not concerned about generating page-views for any other reason than to spread the hobby love (as it were). I get nothing from this page financially, and it’s purely a networking/ sharing of information/ online diary endeavour. For a very long time, the Meph Red and Modular City board articles were neck and neck for views, although the BA paint article has risen from obscurity to eclipse the other two. 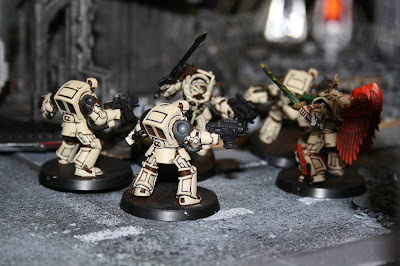 From what I can gather, a fair bit of my traffic is coming from Google searches based on a few key words- a search on any of the terms within the articles above should return a link or image from my site near the top of the search results (searching ‘Blood Angels Paint Scheme’ does exactly this). So, to put it plainly, having the right words within your article’s title will (theoretically) draw in more views that if you were to put in a more obscure string of words. I don’t think my paint article would have had nearly as many hits if I’d called it ‘BA army colours’. Which leads on to another couple of points- spell-check if you are unsure of a word, and try to use terms that are both relevant and are spelt the same no matter who types it in. As an example I’ve tried to be mindful of avoiding the word ‘colour’ in my article names, as we spell this as ‘colour’ here in Australia, whereas our US brethren spell this as ‘color’, meaning that depending on how/where they search they could miss out seeing this article in a search engine results page based on a simple spelling variation. So, there’s a few quick things to help people understand page-views a bit better. If you run a blog of your own, I urge you to have a look at the statistical mechanism behind it to get the best understanding of how and where your page-views are coming from. In the rawest sense (for me at least), seeing the page-views increasing helps drive me onwards and keeps me enthused to keep coming back and writing articles, which in turn keeps my hobby going strong. Win-win. Some of you may ask why I’m doing more Ravenwing- well, to be honest I’m actually replacing some of the previous Ravenwing that I sold off. As funds are a bit tight nowadays I found myself accepting the offer of a young gent who was after some assembled Ravenwing for his own army- I sold him my bike squad (6), Black Knights (3), Dark Talon and Landspeeder for what was basically RRP- he needed them in a hurry and didn’t have time to assemble his own. So, in order to pay some bills I sold those off. However, with the subsequent sale of some more old hobby stuff (it just keeps coming out of the woodwork!) I have been able to replace the Black Knights and DT. Both are undercoated black on their sprues awaiting assembly, although im still yet to decide on what pattern to build the flyer as. Possibly a Dark Talon again, as it fits my playstyle and is slightly cheaper points-wise. Oh, I almost forgot. 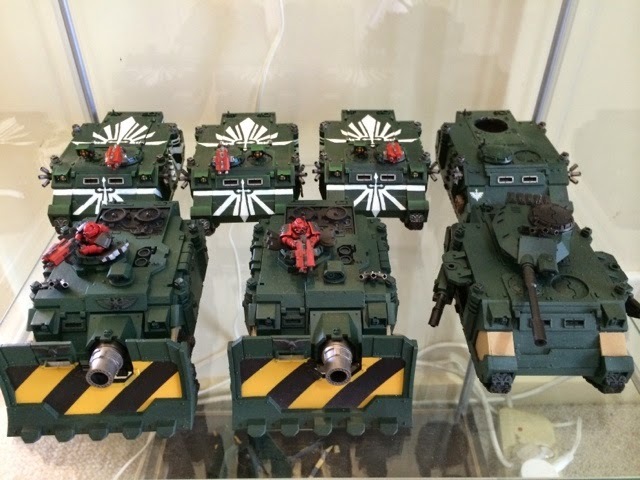 I bought a Baneblade box set, one of the nifty new ones that makes all 8 variants, and spent the better part of two days magnetising it to make every single variant. The amount of engineering involved to due this is quite large- made a lot of sprue-based support bars for the magnets (with bracing to remove any flex), as well as locating pins for gun mount swaps and a host of other small things. This kind of endeavour is not easy and I would strongly advise that people try a lot of small magnetising swaps before ever tackling something like this. You’ll also go through about $20+ in rare earth magnets as well, so that’s worth factoring in. 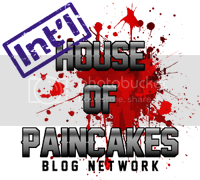 I’m hoping that I can get some photos up for the next post, to show you are the pure magnitude of what I have to be done. 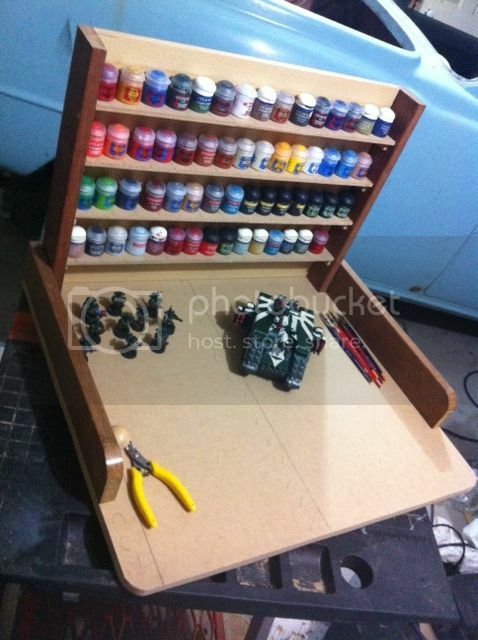 *Speaking of- I built this little beauty out of scrap wood from my garage, I now have space for 70 or so GW paint pots, all my brushes and other hobby bits. Weighs a bit, but its easily moved around on top of a small rolling sewing table that my wife has. No more using shoe boxes for paint storage- going vertical is the way to do it! All thats needed now is some channels carved in with a router to store the brushes/stop them rolling around. 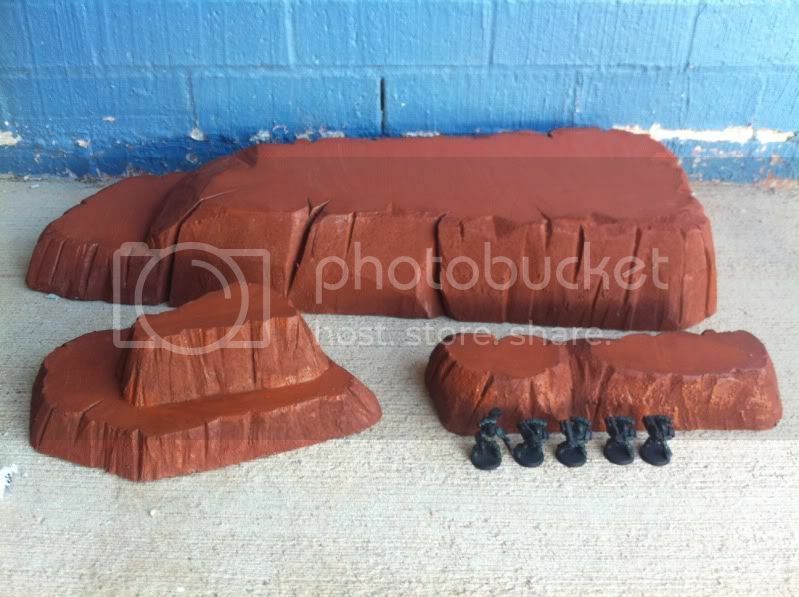 I was recently gifted with a load of terrain from a mate of mine who has moved back to the US, comprising of a load of milk-crate terrain (which I cut out for him, incidentally). Mike did a fantastic job of building and painting up the ruins, adding plasticard panels in a lot of the open spaces (LOS blocking rules!) as well as lots of old gubbinz from things like broken printers and PCs. They’re like a more advanced version of my old ‘Fallout 3’ inspired ruins that Alan now owns, both milk-crate sets should work together on the table beautifully to create a huge ruined city. There’s the possibility of an Apocalypse game in the middle of December, so these will definitely end up getting some use! Mike was also gracious enough to give me all his old blue insulation foam- I’ve never worked with this stuff before, but its pretty impressive. Using a really sharp thin-bladed knife, some PVA glue and sand I’ve been able to craft some excellent hills and some bases for my trees (see pic). 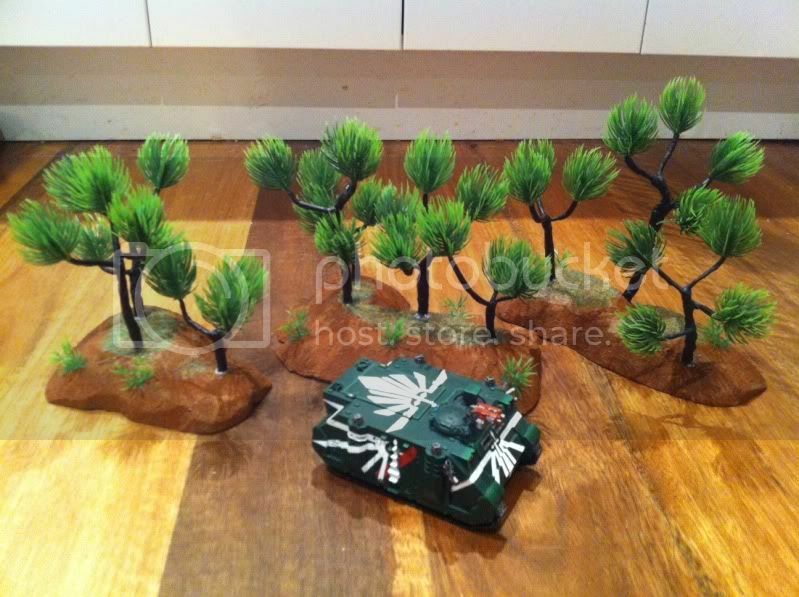 The trees have had some flock added to their bases already, the hills will be getting some soon (ran out of PVA). 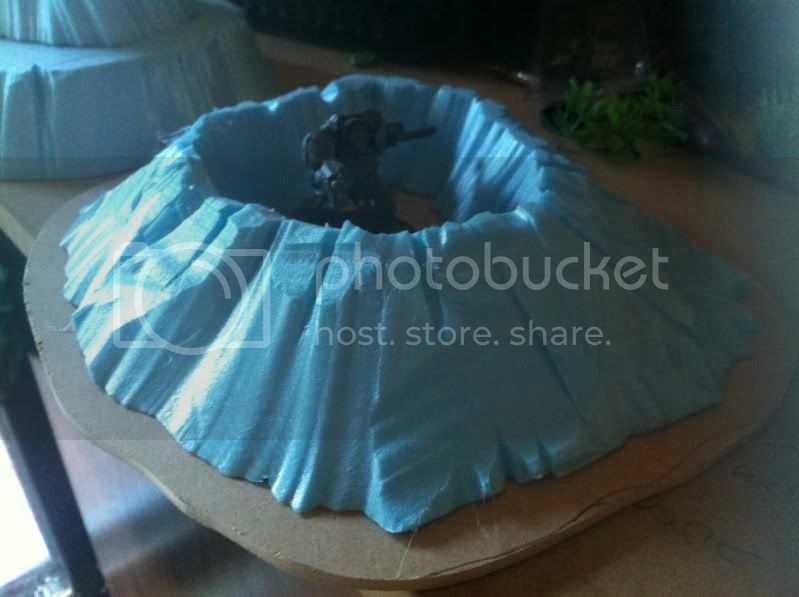 I’ve also started building a load of shallow craters and some steeper ‘pits’ which will be painted up to contain bubbling magma- like a small volcano, or where a small lance strike has hit the ground. For this the blue foam is supreme. I’ve been using simple and cheap acrylic ‘Art’ paints from a tube to paint my foam creations, and there is no need to prime it beforehand- the art paint binds to the foam incredibly well. 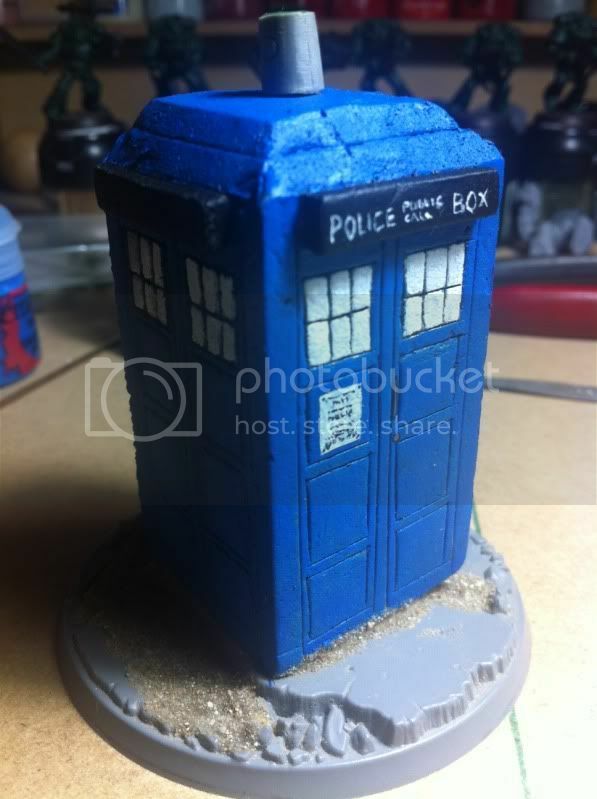 Actually, the first thing I built from the insulation foam was this little 40K objective marker… the Doctor’s T.A.R.D.I.S. J All the window and door details are hand carved into the foam with an exacto blade. I’m particularly proud of how the writing above the door came out, you can actually read it!! Its being based to match my Dark Angels army, and I hope to use it in some upcoming tournaments. Obviously, there's a bit left to do, should have some completed pics up in the next post. Okay, that’s enough for one day!! Will get more up as soon as I can. As always, thanks for looking, and please feel free to leave a comment- I appreciate any and all feedback on this page! 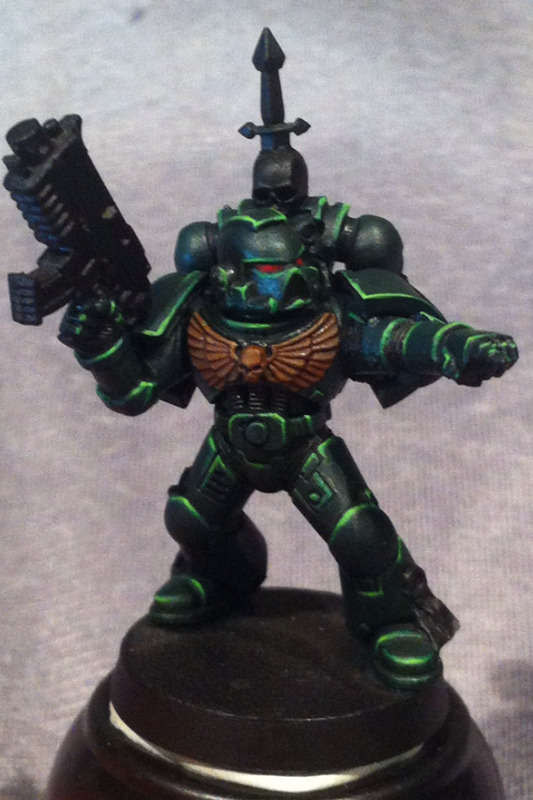 Here's the new power-armour scheme for my Dark Angels- its near enough to the guide in White Dwarf, but with a bit of a different way to add the highlights- the brightest part of the green is centred inside the previous highlight, to make it look almost like its shining in the light. 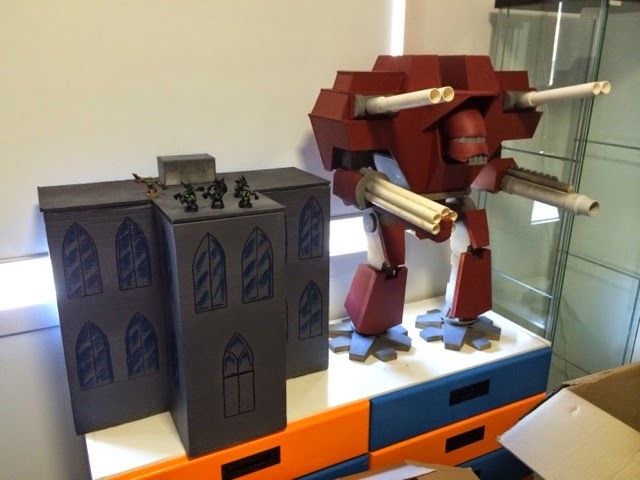 Seems to give a decent compromise between grim-dark and tabletop 'pop'. 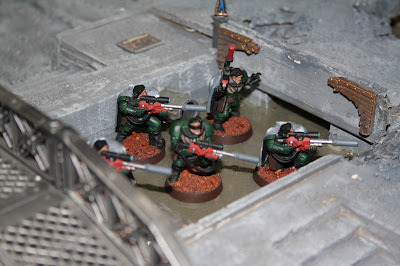 Hope to have two entire squads of ten done up in the next few weeks, if only to this standard. ANUCON in late September is what I'm working towards at this point. Once this guy is done I'm going to put a picture up of him next to one of my original Dark Angels from second edition, to show exactly how far I've come! Today i'm putting up some throughts I've had regarding the units I fielded for Wintercon, weighing up the pros and cons. Im thinking of using some of this list as a basis for a 1500pt force for ANUCON in late September. 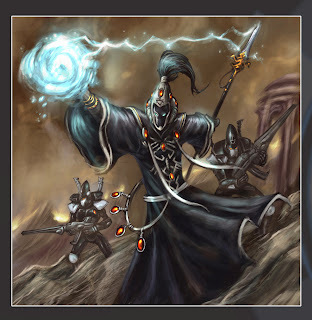 Belial was instrumental in allowing me to put various DW units where I needed (deepstrike without scatter), mainly to allow for maximum shooting damage and also to threaten units that may wish to charge them. 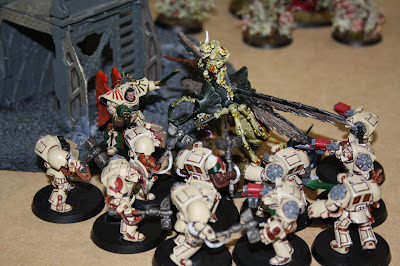 He never got a successful enemy Warlord kill, as he was taken out by a Great Unclean One and Kharn (both out of his league), and in all other games was simply brought down through weight of fire. However his main benefit was making the three DW units ‘troops’, and for his points cost he’s definitely worth taking. The missile and twinlinked autocannon/ lascannon dreads were great for sitting at 48” range and throwing anti-armour shots out, I had a few games where they out-ranged their opponents and survived the entire game (pre-measuring rocks). Both are very effective for their points, and the number of shots/twinlinking allowed them to land quite a few snap-shots at Flyers (a Stormraven was their biggest flyer kill). I will definitely try keeping these guys in my 1850 lists, they are great to use. These two squads racked up more kills than all the rest of the army combined, due in no small part to their ability to Deepstrike in and have twinlinked shooting- the Plasma Cannon is now my favourite DW heavy weapon. They almost always ended up in close combat and with Termy armour/ pfists they acquitted themselves well. For the next tourney (possibly ANUCON) I might subsume a couple of TH/SS termies into each shooting DW squad (end up with 7 or 8 per unit) to give some dedicated MC defense/offense and to tank the big hits. 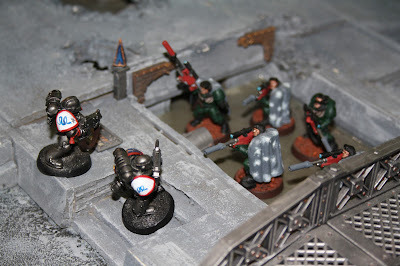 These guys actually spent a few games deployed on the ground in front of key units as a barrier against fast-closing assault units, or were used to run forwards to join the deepstriking DW shooty units as a counter-attack punch once those guys had engaged a nasty target unit. As expected they took a load of punishment, and only ever died under a huge number of shooting or close combat attacks. 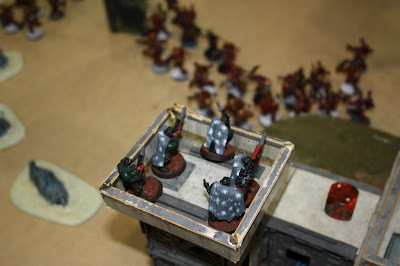 As mentioned above, may just absorb these minis into the two shooty DW units- one to enter with Belial (no scatter) and one to land independently and form another bulwark/strongpoint. However, another thought for certain games is to deploy them facing the biggest/fastest threat with Belial in their midst, advancing forwards tanking the hits, and then deepstrike in the other two ‘shooty’ DW units on turn one or two (depending on circumstance) within 6”- Belial’s teleport homer will let them land without scatter, suddenly tripling the amount of Deathwing in that area- possibly good for wrong footing the opposition or dominating a flank. 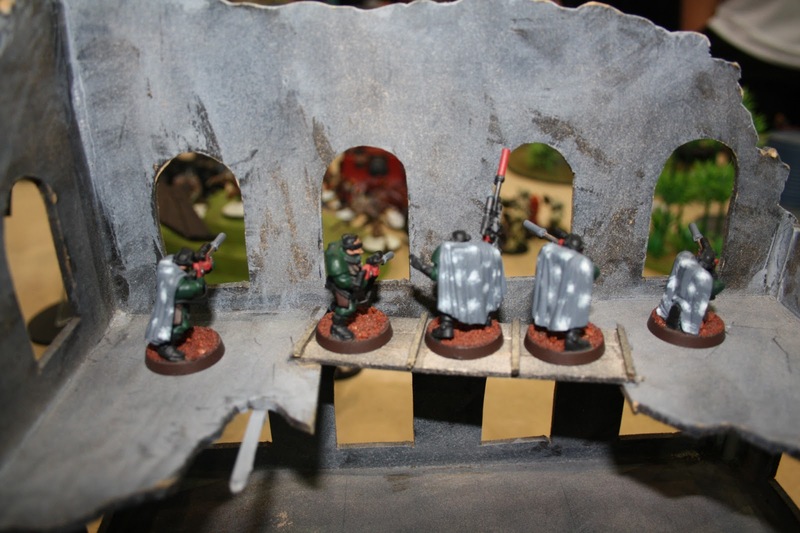 The snipers were excellent for a measly 70 points, which included their camo cloaks- most of the time they had a 3+ cover save meaning they had awesome survivability, and the Vet Sgt kept them in the game with his Ld9. 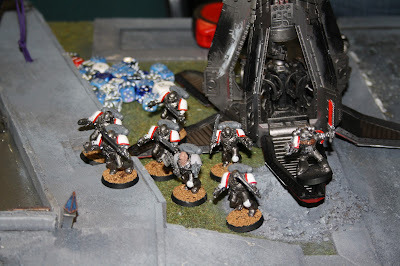 Although they landed a heap of shots, they never achieved any Rends or Pinned any units, but were able to draw a heap of fire and took some objectives in a few games. For their points cost they’re great, although I’m thinking of chucking in a Missile Launcher for some extra sting with harassing units- for example a frag missile against MEQs is wounding on the same roll (4+) as a single sniper shot, so for an extra 10 points I could be getting four or more shots with a frag blast, and even when accounting for Rending the frag is statistically better at causing casualties. Something to playtest I think. Not much to say here, except that the new Stubborn rule kept my boys in the game many many times- none of the non-DW units (ie not Inner Circle) broke, ever. This allowed me to stay on the board and in a few cases I was able to deny VPs to my opponent where the units still had a couple of guys left at the end of the game. 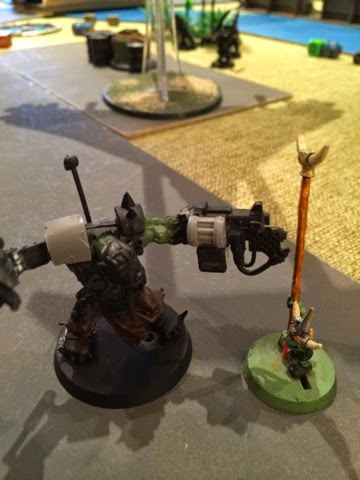 The heavy bolter I took was fairly useless in most cases, I feel paying the extra points for a Plasma Cannon would have been a much better idea, although the Flamer was good- I assaulted some Khorne Bezerkers (honestly, it was better than being charged by them!) and I got 8 hits on my way in, flamers are awesome!! Wow!!! With only three of these guys (126pts) I did some major damage coming on with Outflank. Skilled rider meant ignoring difficult terrain and one point better cover/jink save (4+ normal, 3+ turboboosting) which gave them incredible survivability, I survived high strength pie plates and heavy weapons fire and almost every time was able to get off a Rad grenade hit on the target unit. Knocking a point of Toughness from enemy units wasn’t ever really doing any difference when they fired with their Plasma Talons, (still 2+ to wound most of the time) but it certainly helped when I had the Dark Talon attacking in tandem, or sending fire from the Devs or Dreads- I took out a host of T5 multi wound Spawn like this- drop them to T5 and hammer in the Str8+ fire for instant death…. I am still thinking that it would be a smart idea to upgrade the Huntsmaster to have a power weapon (sword) as the Corvus Hammer’s Rending just isn’t dependable enough. However, the ability to hit-and-run (and T5) does mean you can engage 3+ armour and run off (through cover) 2D6 inches once you’re done to keep the bikes alive. 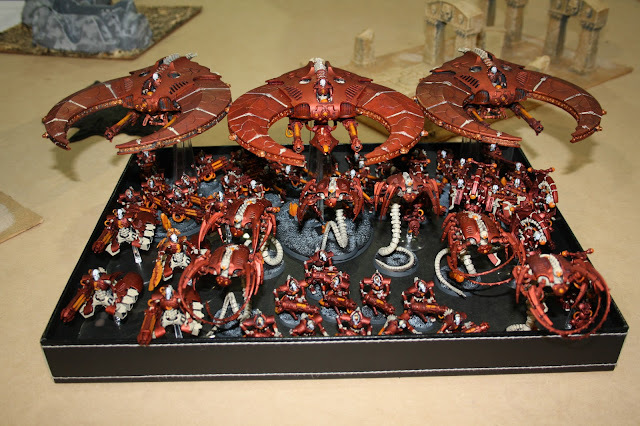 Im hoping to pick up another box set of RW BK’s and flesh it out to five or six bikes for maximum plasma carnage, and also to boost up their close combat capability. I did a lot of Internet searching before deciding whether to build a Dark Talon or Nephilim from my boxed set, and can happily say that IMHO i've made the right choice. The DT puts out magnificent ground-support firepower from its Hurricane Bolters and can easily de-buff enemy units with its ability to blind (Rift Cannon) or impose a -3 on both WS and Initiative with the Stasis Bomb. Being a flyer means that in a lot of cases you have the speed to always be in rapid fire range for the bolters- 12 re-rollable Str4 shots can mow down light infantry and even make a mess of MEQ targets. In this tourney I ran it in tandem with my Black Knights- coming in from outflank they used their grenade launcher to lower enemy toughness (and get their Plas shots off) and the DT would then unload with its armament and in most cases finish the job. These two units work brilliantly together, and even though I believe one could be taken without the other i'd be hesitant to do so- they compliment each other very well. Although the DT does have the ability to hover I've never used it, although it is a useful ability if I need to plot a flight course that may end up taking it off a table edge (which in some games could mean its counted as destroyed for VPs if the game ends), however this is also subject to the army I'm facing and their AA capability. 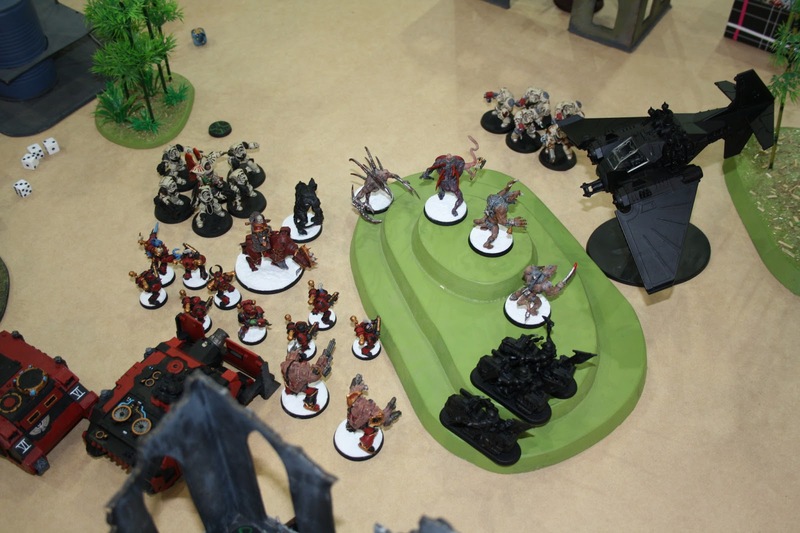 A good idea might be to run it into a far back corner mid game, and then hover in the next turn with a 180 degree pivot before coming back across the board for another two-turn strafing/bombing run- this may be useful against Nids or other armies with low AA abilities. As its a support craft for attacking ground troops it works well, as mainly second-turn arrivals mean its within range of targets that my ground forces should be just about to assault (esp. where DW have deep-striked in turn one). So far, very happy with how this has turned out. Not surprisingly the Devs drew some serious firepower from my opponents in all games, the only way I could guarantee their safety was to take shelter in ruins or out of range of opposing fire. I used them twice to literally stall enemy flank movements- whilst the enemy armour did advance it did so very slowly, trying to hug cover and take as little damage as possible. 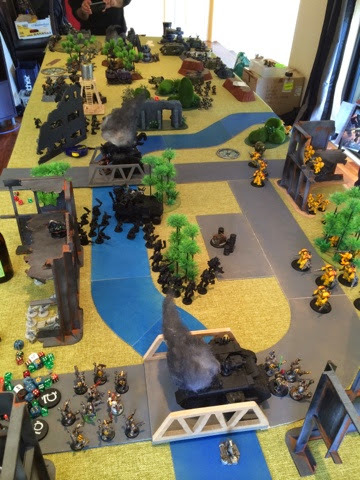 In conjunction with the Dreads the Devastators threw up loads of Krak Missiles trying to knock enemy flyers from the sky, and in one game they landed 3 hits which all penetrated, however my opponent was able to safely jink each one! Im thinking that it might be worthwhile to spend the points and buy some Flakk Missiles (60pts for all four launchers) as this would allow me to tackle flyers and free up one or both of the Dreads to continue harassing ground forces. Only problem is that Flakks don’t give you the Interceptor rule, so you have to weather a turn of fire before getting shots off. Will be definitely playtesting this setup to see how good it is for the points, which are starting to get quite expensive. While I don’t think they’ll in any way fix my Helldrake woes they’ll definitely provide a foil for the flyers of most other armies. So, do you agree with my thoughts, or have anything else to add? So far im happy with the way the Dark Angels play under the new codex, and the new units seem to work togehter well. Hey everyone! I'm back now from Wintercon, held here at EPIC in Canberra, after a two-day, five battle odyssey! 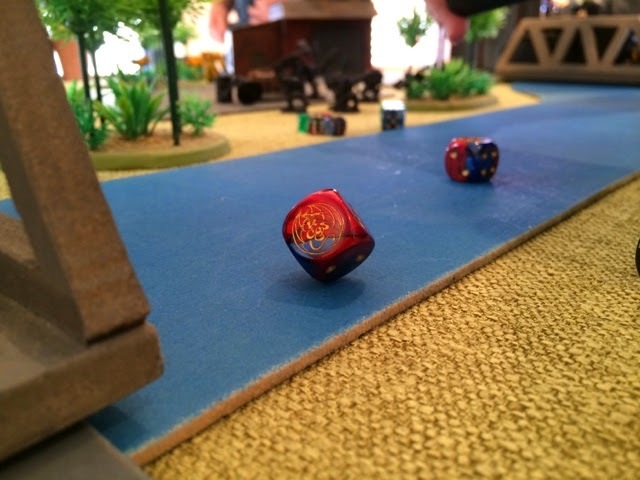 There were highs, there were lows, and even some middle ground, but all in all I got to roll dice, meet new people and have a great time so nothing to really complain about (aside from having a cold). Wintercon itself was reduced from three days down to two- although the 40K side of it has always just been a two-day event- however this year the second day was only five games (instead of six), meaning that the second day was a lot more relaxed and we were able to get away relatively early- important when you have a young family as I do. 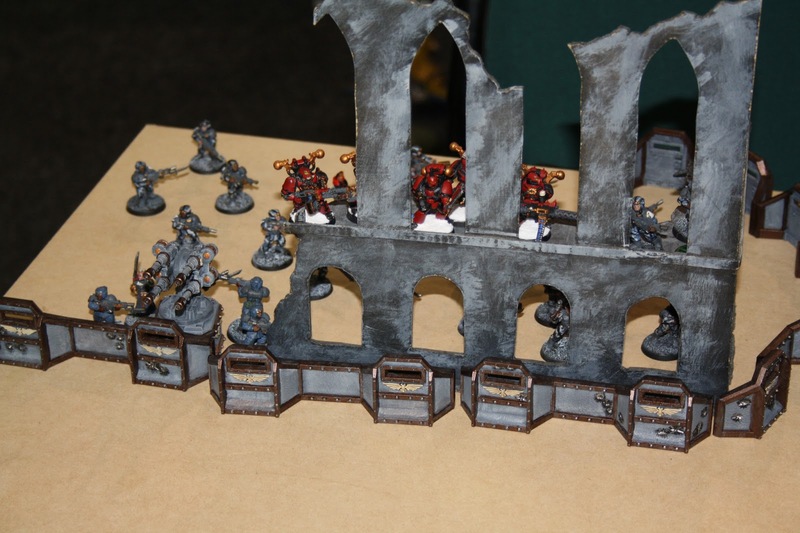 As I'd previously sold off my terrain (well, most of it) as well as my Blood Angels I wasn't really intending to go along anymore, however about 3 weeks out from the event I thought it might be worth a go. Cancon had kind of burnt me out a bit and left a bad taste (Im still not entirely sure why), so I thought that Wintercon might be worth attending to see if it could rekindle some of the love I have for tournament play. To that end I pulled out what I had of the Dark Angels that werent in pieces/ in the Simple Green and tried to build a decent list that I could semi-complete in time for the 'con. Settled on the list below, based on what I had and what I could build in the time beforehand. Tactical Squad (10)- Heavy Bolter, Flamer, Vet. Sgt with Power Maul. Anyhow, on to the battles!! We were basically chasing down control of 6 objective markers, each worth 3 VPs. Antonio set up first, and I failed to seize. Dark Talon and Ravenwing Black Knights make their maiden appearance, and debuff/own everything in their path, working in tandem. The DT soaks up loads of AA fire from the quad gun and keeps going! Deathwing deepstriking on turn two and open fire with twinlinked to annihilate the Spawn and wound the Khorne Lord. The Vindicator was unstoppable! Couldnt even glance it with loads of missiles, Las cans and autocannons, so it just kept laying down the huge blasts. My TH/SS Deathwing absorbed huge Plasma fire from the CSMs, a round of shooting from a Vendetta and only very unluckily died to a concerted four meltagun attack from the IG command sqaud that had disembarked- would have been a couple more points in my favour. Similar story for the Tac squad parked up the back- the Helldrake came in and Baleflamed them to death, before destroying my last dread with a merciless vector-strike in the last turn! Lengthways boards arent the best for my army, which is mainly subdivided into green/white/black portions all designed to work together at close quarters- this was going to be a long table shooting gallery, so I was forced to get up in the Eldar/DE's face to try and get into close range.. Result: Disastrous Defeat to me (not really unexpected- vehicle heavy list with insane firepower and range. And twinlinked everything, and so on etc etc. On a lengthways board...). Tabled! Scouting RW Black Knights were able to pop open a Falcon underneath Dale's giant Skyshield Landing Pad, using only a couple of Plasma Talon shots. Honestly, that was it- the rest of the time i couldn't hit anything, do wounds or armour pen, and got run around like crazy.... hence the giant list of things that went wrong. Table deployment setup and cover was minimal for me, which really made it hard to get any forward momentum going. 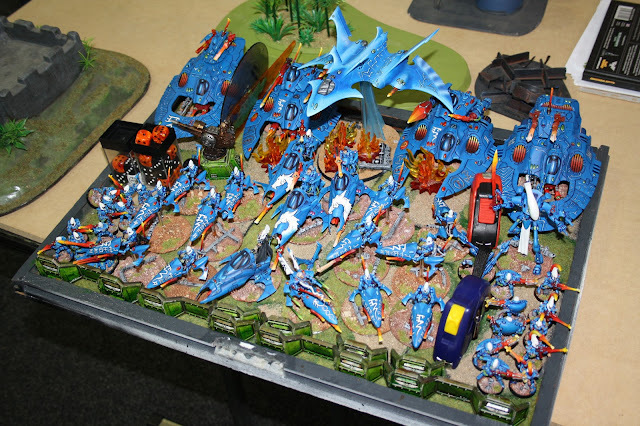 Eldar Farseers on jetbikes with 2+ cover saves and rerolls and crazy jacked up combat drug-like psychic powers (rampage?? )= lots of dead things. Epic. Every Falcon put out a bucketload of dice to hit- most re-rolling, some ignoring cover, some ignoring armour. Had no reply to that!! Deepstriking my Terminators in really wasnt the best idea in this mission- should have castled up or advanced in a large block to the central terrain- all my units got picked off piecemeal at range. Dark Talon was dropped by a couple of Falcons throwing buckets of Str6 shots its way, had no ral chance of jinking out of it. Just versing this beautiful army was a treat in itself (albeit slimy and nurgle-y)! 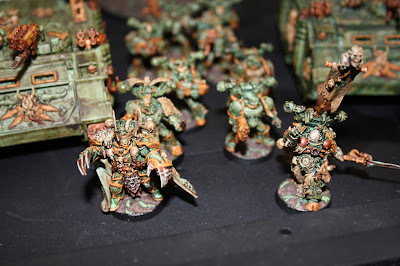 Loads of FW and new Daemon units all round, with loads of customisation. Kept all my Deathwing on the board and put the Hammernators in a defensive line to shield the Tacticals and Scouts perched on the round bunker terrain behind them. They and Belial eventually ran into a line of advancing Plague Flies and wiped them out, before engaging the Great Unclean One. 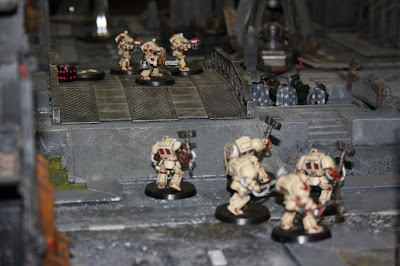 Tacticals and Sniper Scouts poured huge amounts of bolter/ sniper rifle into multiple units, inflicting decent casualties. They were continuously bombarded by a Plague Drone (flyer) and lost most of their men, however neither broke at all. The Black Knights and Dark Talon came in right next to a squad of Plaguebearers that had materialised in my deployment zone- Rad grenades, Plasma Talons, Dark Rift Cannon and rapid firing twinlinked hurricane bolters saw them wiped out in short order! Belial accepted the Great Unclean One's challenge, and basically muffed most of his attacks, either missing his swings or failing to wound (one a 2+!!). Only thing I had forgotten was that he had a re-roll for every five guys he is leading- there were five termies backing him up. Wouldnt have done much to be honest, there was a load of invulnerable saves I failed. The portal that Eddie dropped near my Devs and Dreads was scary- kept dropping out D6 amounts of any type of lesser daemons, which diverted fire away from the big scary soulgrinder in the distance that I was trying to blow up. In the last turn one of the Plague Drones landed a blast template on the last survivors of the Tactical and Scout squads- their deaths giving Eddie enough VPs for a tactical draw, and getting his unit in my deployment zone for Linebreaker. This game saw Evan and I on Eddie’s beautiful modular-style city board. 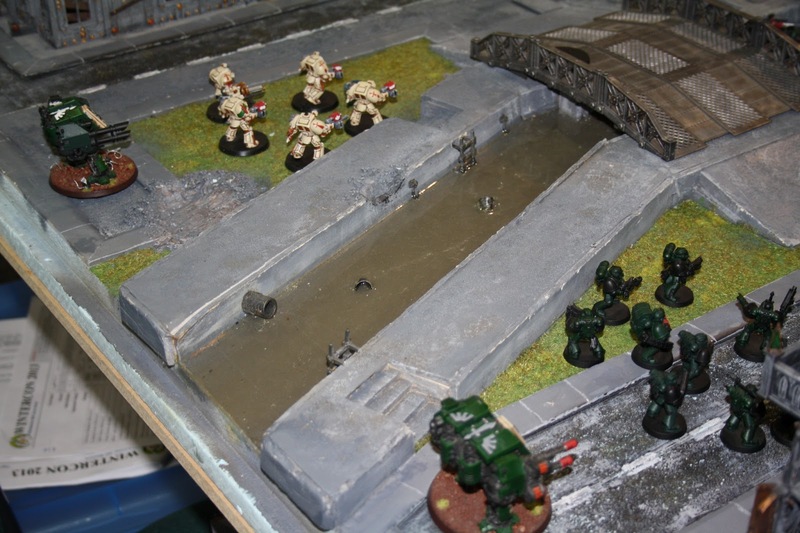 Once the markers were placed face down and deployment was done I infiltrated my Scouts to the middle of the board, in the canal that ran up the centre, giving them lots of nice cover (3+ with their camo cloaks). Evan had won the roll for first deployment/ turn and I didn’t attempt to seize. The markers when turned upwards were quite in my favour- I had the ‘4’ in my deployment zone, a ‘3’ was on the bridge close by, a ‘2’ right next to my scouts and the remaining 1, 2 and 3 were closer to Evan’s line. Result: Victorious Slaughter to me, all secondaries acheived. The terrain was AWESOME! Evan and I had a great time fighting over this board, it was exceptionally scenic and made for some awesome photos (See below). 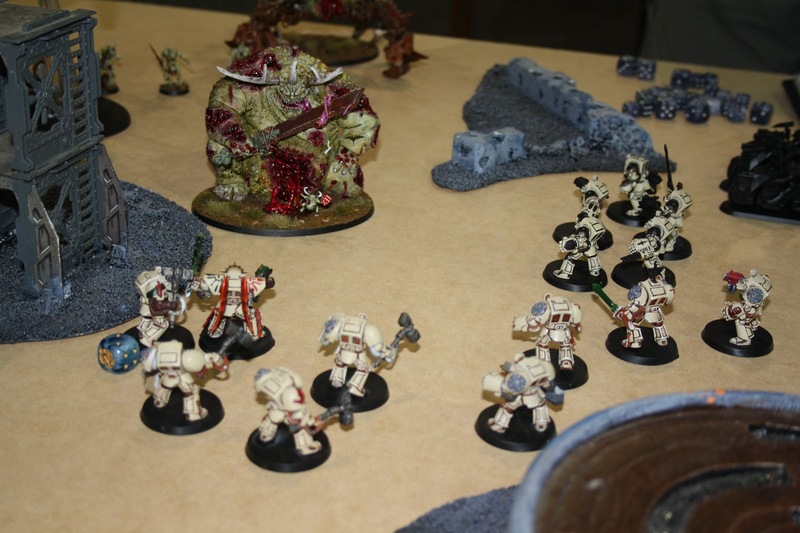 The Deathwing proved extremely resilient, soaking up loads of Bolter (and worse) firepower, and their Fearless rule kept them on objectives even when taking casualties. 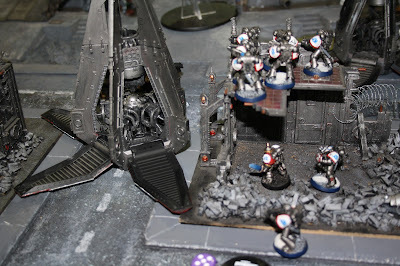 The Dark Talon mowed down the remaining Assault Marine next to his Drop Pod- 12 twinlinked boltgun shots will do that!! Rapid firing chews through infantry. The Lascan/ML Dread lined up the rapidly approaching Stormraven and dropped with with a Lascan shot straight through the nose- the giant assault transport dropped like a stone, however it landed on the squad of Scouts with a S10 large blast! 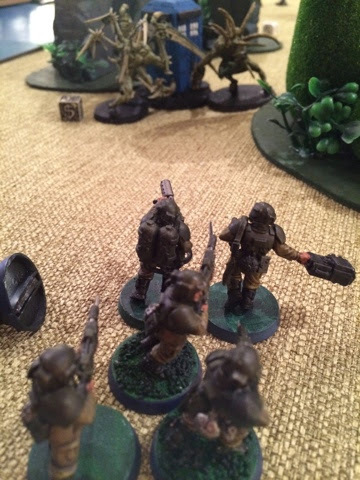 Somehow the one scout pulled himself from under the wreckage, to face the three Command Squad Veterans who had survived the explosive crash- they were keen to avenge the death of their Captain! Belial and the Plascannon DW squad dropped in close to the Khornate lines and opened up with a huge burst of firepower, wiping out 7 bezerkers from one squad alone. 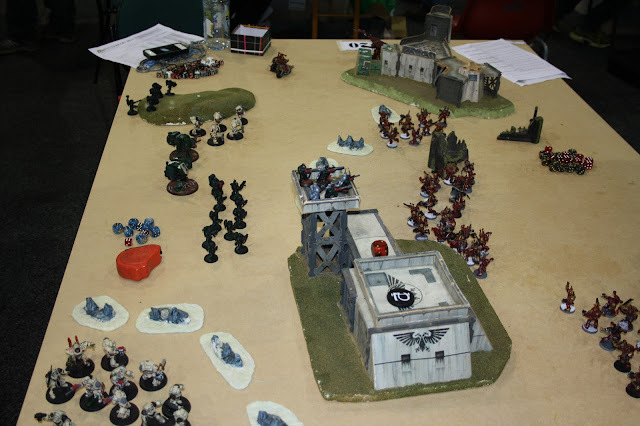 The other squad dropped behind in Ben's deployment zone and opened up on Kharn's Bexerker squad, but the Assault cannon used 'split fire' to target the Forgefiend to their left- one rending shot shot got through and detonated the steel monster! The Black Knights Outflanked on from the left side in turn one, hitting the Daemon Prince with a Rad grenade, and then four twinlinked rapid firing Plasma Talon shots- he failed all his Invulnerables and was sent screaming into the warp! The Dark Talon was poised nearby to open up with everything but found itself without a target! 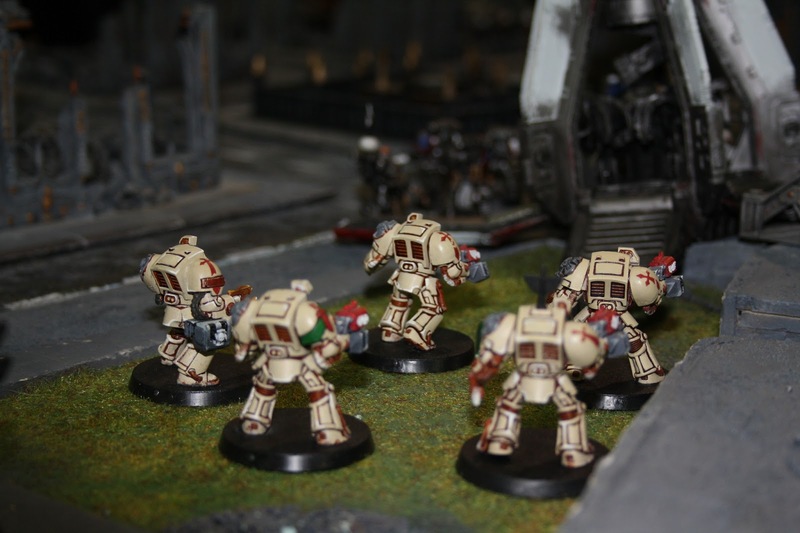 The two Deathwing Sgts and the Tactical Vet Sgt all land precision shots before engaging in close combat- two power-fist wielding Champions are dispatched before they can cause too much harm. The Tactical Squad decides that its best to not let the Bezerkers get a charge in- they assault themselves, boltpistols and flamer blasting away! 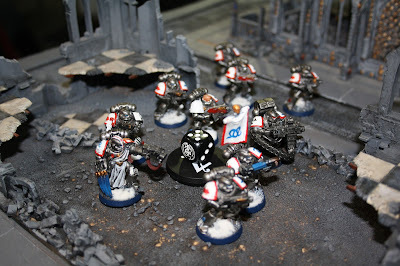 They stayed in the battle with leadership tests each and every round as they lost men but never broke, and were only finsihed when Kharn joined the fray. When Kharn finally detached and set off to his own deployment line to engage the last DW squad the DA Lascannon dread decided enough was enough- a single shot vaporised Kharn and it was all over. Kharn carved up Belial before he had a chance to reply- he laid down 7 wounding hits, and Belial failed three, using up all his wounds. He then carved through all the Terminators in the next round, with his 2+ to hit AP2 Str6 (re-rolls to wound) 6 attacks... very frightening! Game 1 VS Antonio's Chaos Marines with IG allies- the traitors are holed up behind their Aegis defence lines. 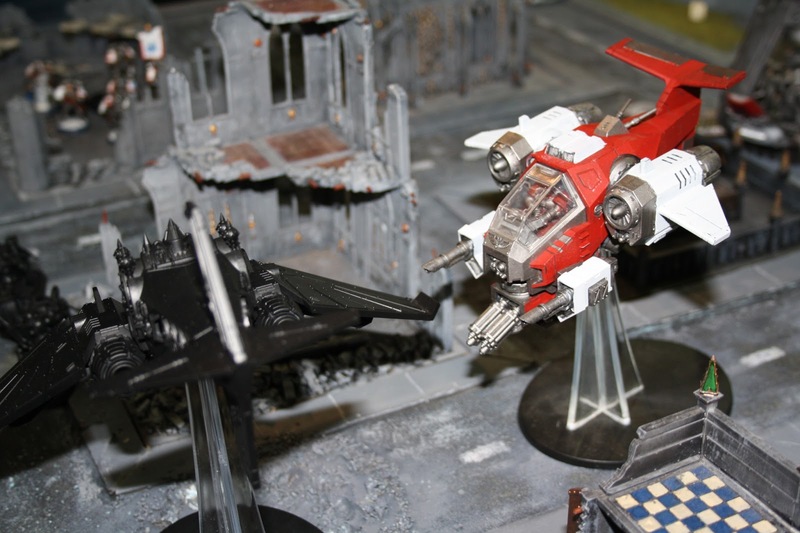 Maiden runs for the Dark Talon and Black Knights, both very promising! Belial and his DW associates, making friends 'the DA-way'. The cowardly Khorne Lord backed away instead of stepping up for a fight! 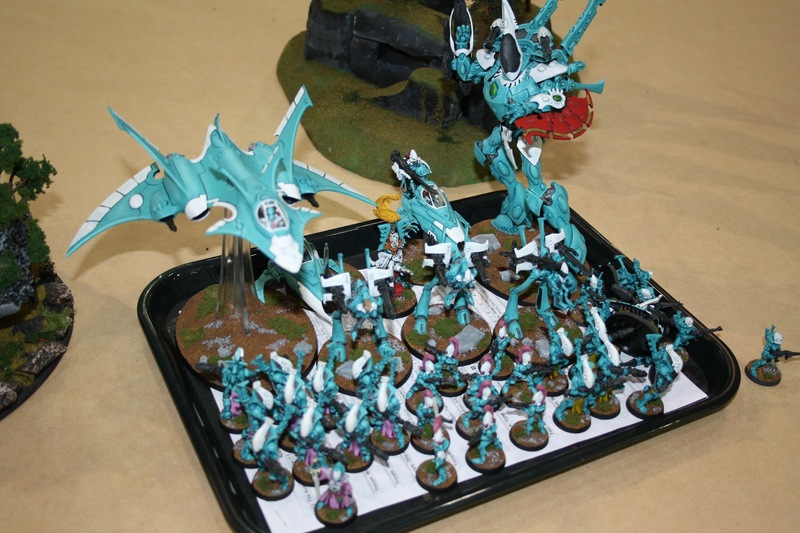 Lovely aqua coloured Eldar Force with new flyer and wraithknight. Necron 'croissant and wraith' list- great metallic red base colour. A pustulantly lovely Nurgle themed CSM list. Luke's very highly detailed Eldar army. 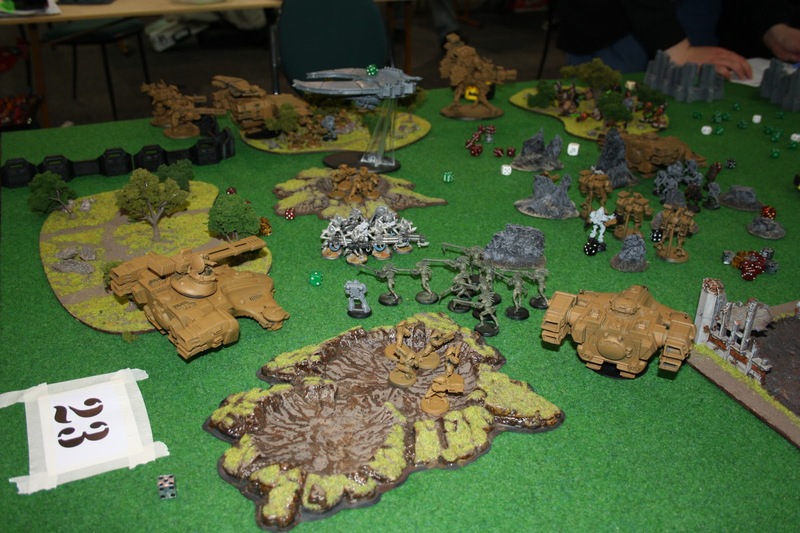 Necrons and Tau do battle over a verdant green battlefield. One of the Plague Drones swoops in opening fire on the Tac Squad and Scouts. Despite many casualities they hold firm. The last Plague Fly is cut down by the swarm of DW termies. A bigger challenge prersents itself- so long Belial! 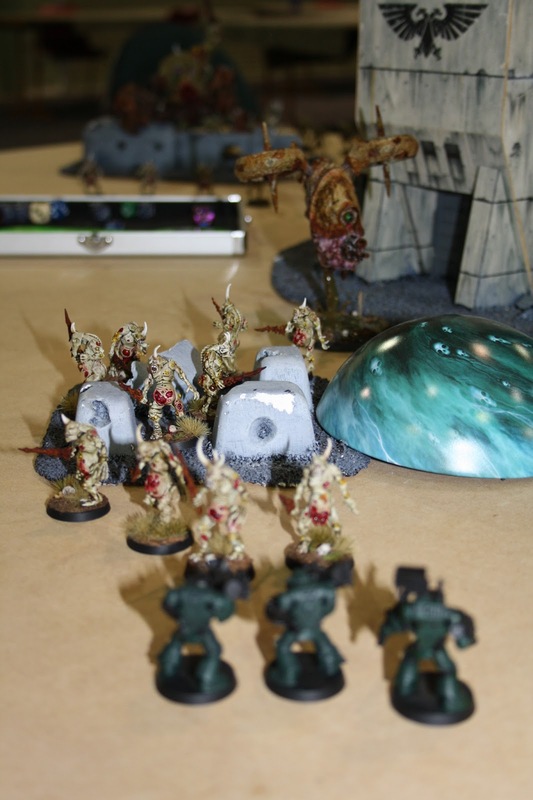 Plaguebearers come swarming out of the maelstrom to threaten the Devastators. 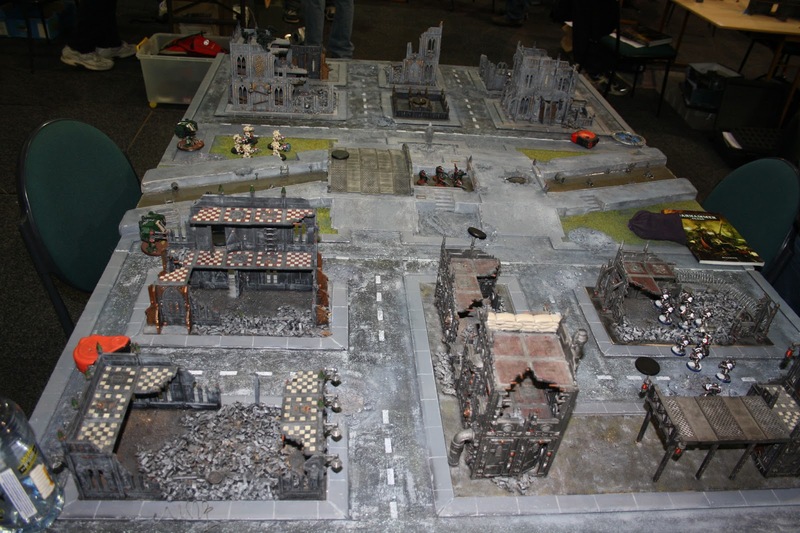 Eddie's semi-modular urban terrain board- a joy to game on. 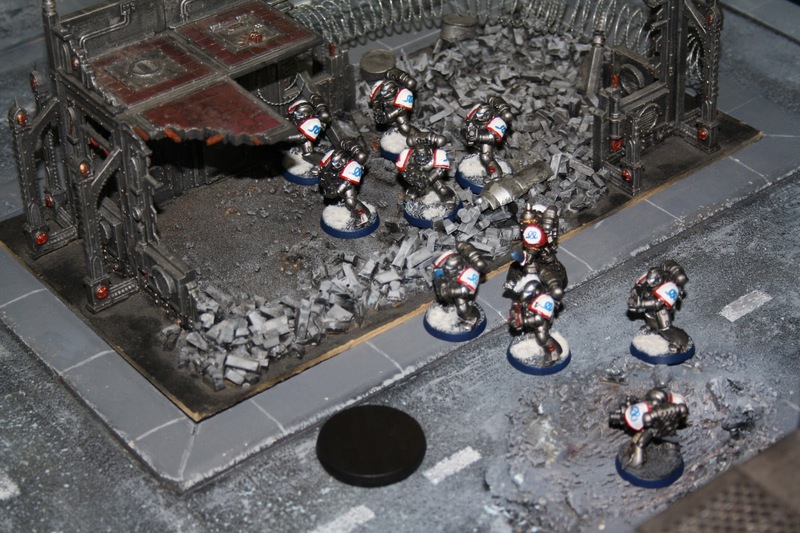 Evan's Iron Snakes deploy near one of the mystery objectives. 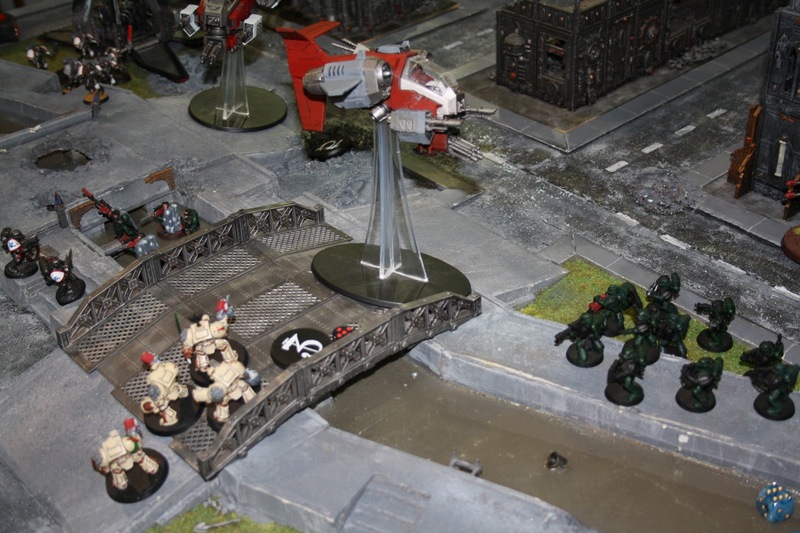 The Dark Angels amass on either side of the bridge, which has an objective marker. The Scouts infiltrated up the canal in some nice and solid, if somewhat murky, cover. 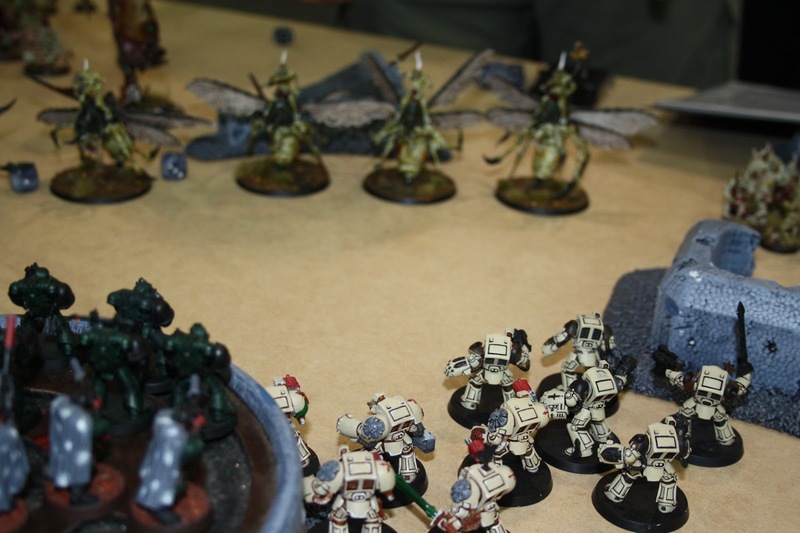 A Drop Pod full of Tacticals slams down in front of the Deathwing on the left side of the canal- they pour fire into the squad and then kill all but two in close combat- the survivors retreat. An Assault Squad pours out of their drop pod near Evan's deployment zone, seeking vengeance. Tacticals hold an objective which is giving them a 3+ cover save (shield generator). 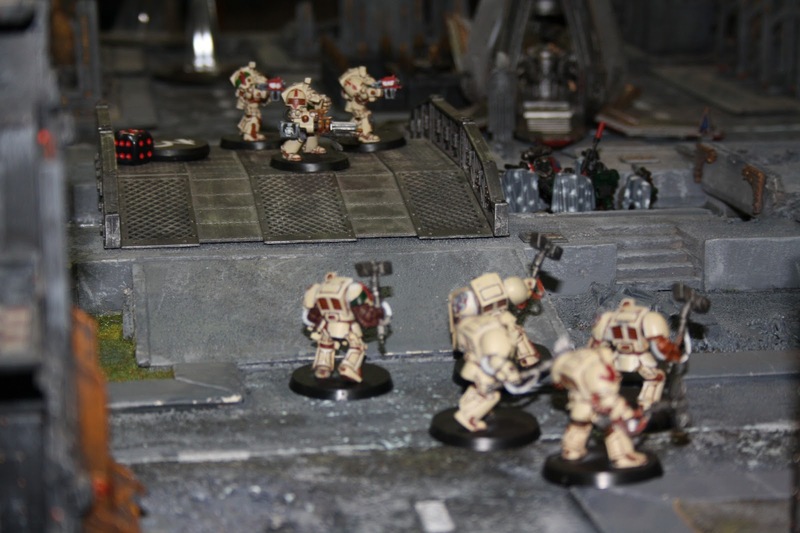 Survivor's of the Deathwing's attack, these Tactical Marines rally and assault the Scouts in the Canal. One scout lands an overwatch hit but it glances off harmlessly. The hammernators Deepstrike in and set about creating a defensive line to protect the objective behind them. 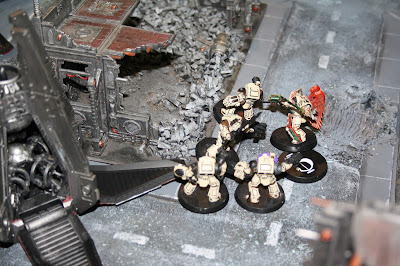 The DW squad on the bridge kept split-firing at the Drop pods and Stormtalons but didnt achieve anything. 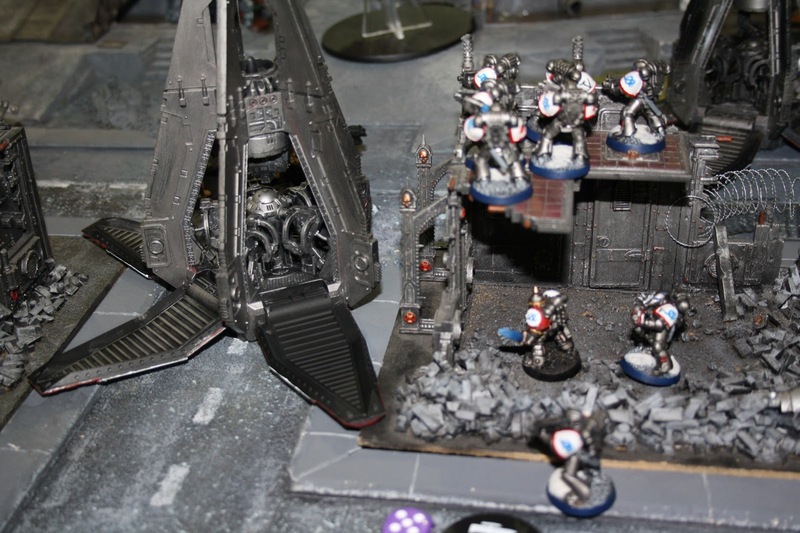 The Ravenwing Black Knights and Dark Talon launch a furious attack on the Iron Snakes Tactical squad but the DT is shot at by the Stormtalon, luckily all the shots pinged off its armour. 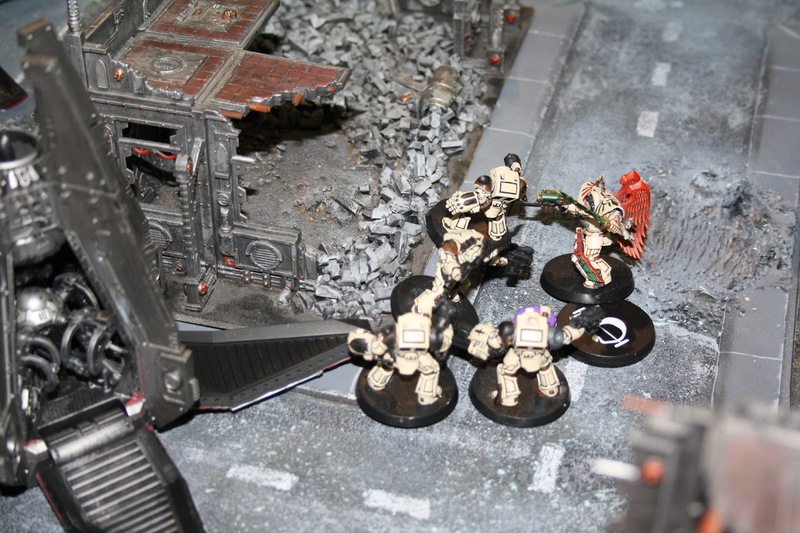 Belial and the Deathwing consolidate onto the '3' objective after wiping out the squad that held it in close combat. Game five Vs Ben's Khorne CSMs, led by Kharn. The Snipers throw shots into the approaching horde. Next post will be up really soon, with a detailed analysis of how each unit performed, ideas for next time, etc!